Have you ever tried olive oil straight out of the jar? Well, it tastes a lot different than just sprinkling it on your food. 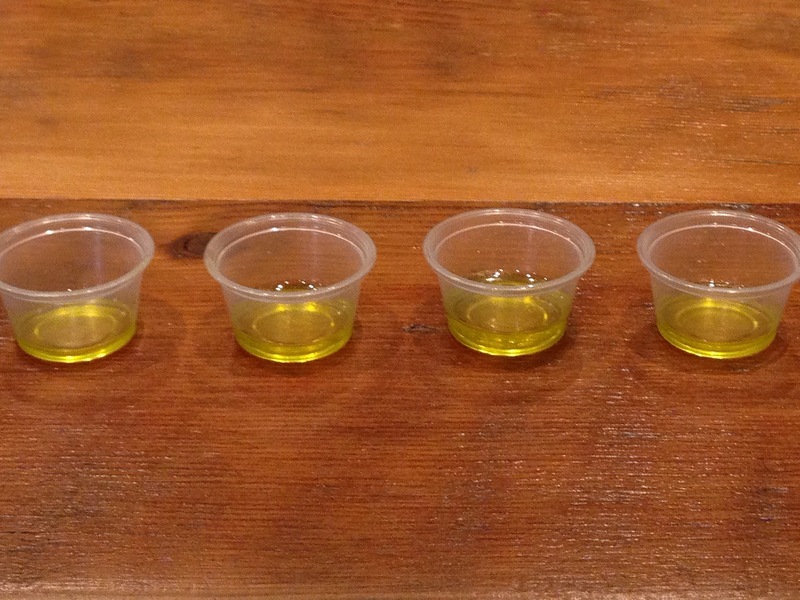 Recently, I had a great experience taste testing olive oils at Olive This, Olive That in San Francisco. 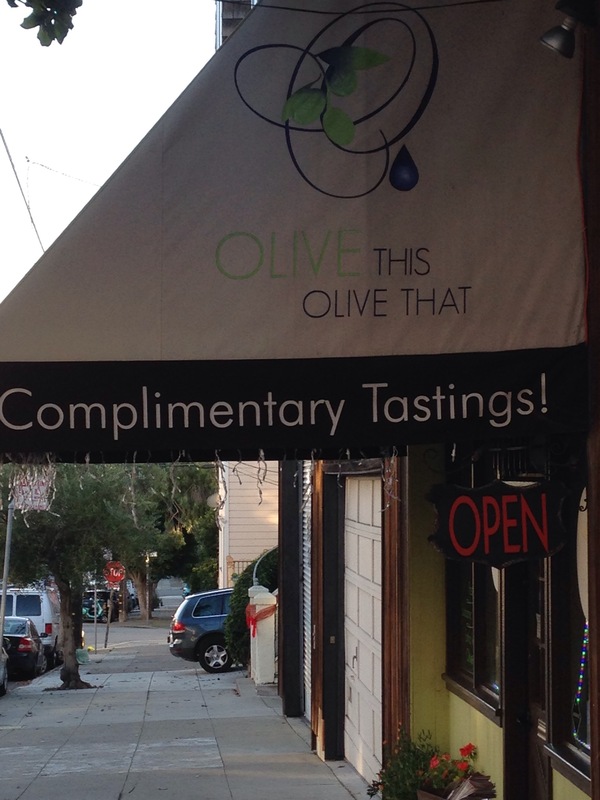 I had just had a bad experience at a restaurant and was walking around the neighborhood to see if there was anything that interested me when I saw a sign for an olive oil shop around the corner. We were the only ones in the store at first and that was good so we could have a good look around the store without anyone blocking our view. They had two sides of the room. One side contained vinegars and the other side contained olive oils. 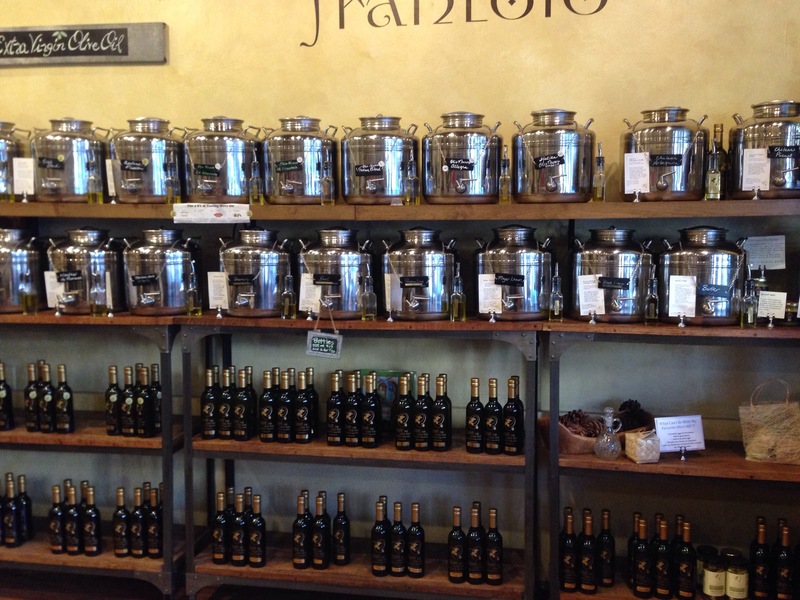 I went over to the olive oil and looked at the jars lined up neatly in two rows. The top row was just plain olive oil but from different parts of the world. The bottom level contained infused olive oils. That means they are mixed with other fruits or flavors. The man at the store said his name was Richard. He was not the owner but he told us the owner’s name was Janell. Richard was super nice to me and he let me taste test four different olive oils and he taught me a lot of things. He even taught me how to taste olive oil properly. Here’s what you do: first, you swirl the olive oil in the palm of your hand to warm it up and the aroma gets released. 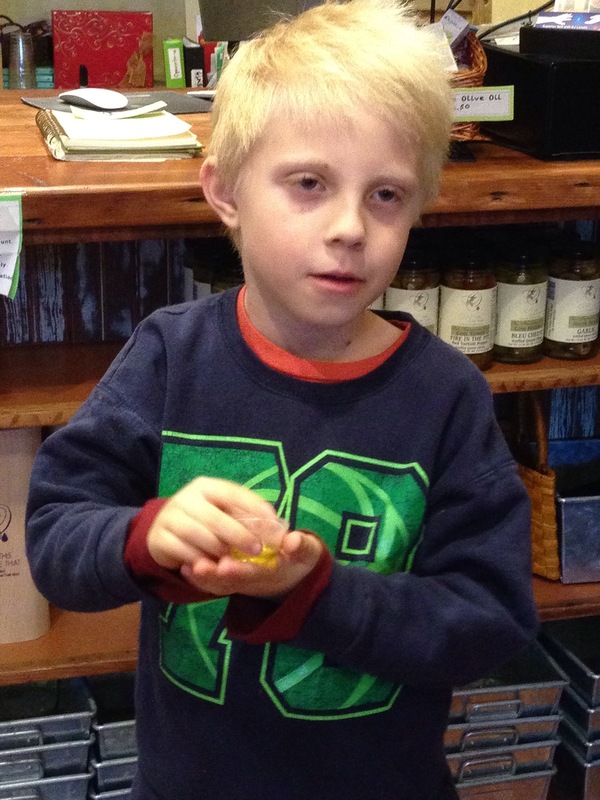 Then you sniff the olive oil to see how it smells. 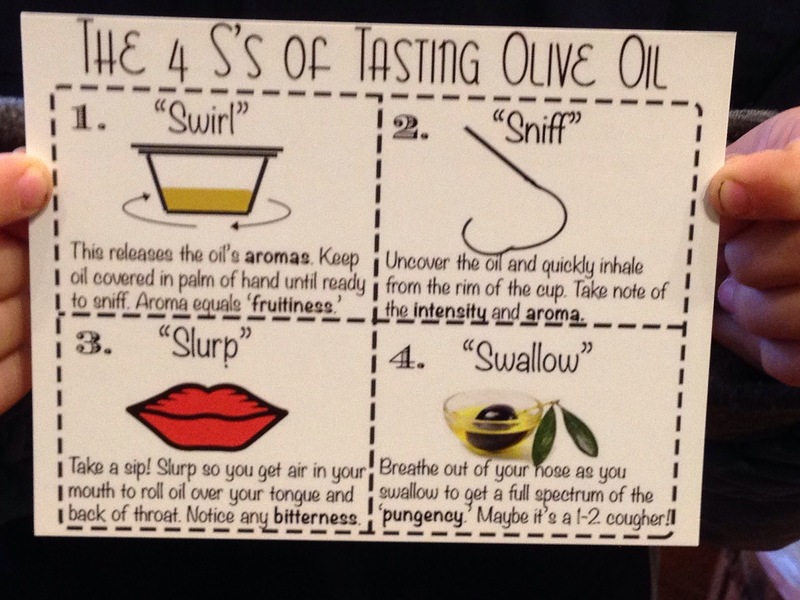 Then you slurp the olive oil. You don’t just take one gulp, you kind of take air in at the same time – but you can see in my video how to do this. Last, you swallow the olive oil and hopefully it’s good. And all of the ones I tried definitely were! 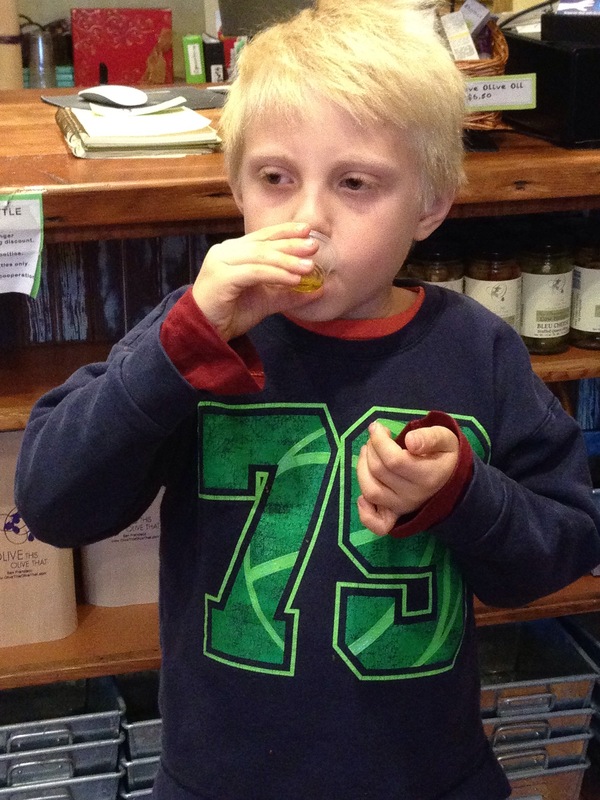 And that, my friend, is how you taste olive oil! I was so interested in these olive oils that after we got home from the shop I did a phone interview with the owner Janell. She told me that she calls olive oil “fruit juice” because olives have a pit in them and the oil is like the juice of the olive fruit. If you think of it that way, it’s really healthy! She also told me she would be interested in opening a store in Los Angeles – if I would run it! I don’t think I would be very good at that job because I would keep stealing all of the olive oil! I’ll show you all the vinegars too!